The so-called humoral immune response is mediated by plasma cells and plays a central role in combating infections. Plasma cells secrete antibodies – a class of proteins that specifically recognize infectious pathogens and facilitate their destruction. Individual plasma cells make only a single species of antibody that normally recognizes a single structure. Nevertheless, antibodies with certain specificities may erroneously attack the tissues of their host, causing autoimmune diseases such as multiple sclerosis (MS) or lupus erythematosus (SLE). “Balanced regulation of the production and activity of plasma cells is therefore vital,” says Professor Edgar Meinl (LMU Medical Center). 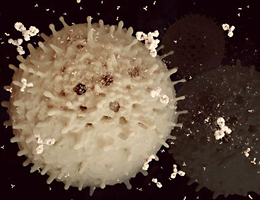 Long-term antibody-mediated immunity is provided by so-called long-lived plasma cells, and Meinl and his research team have now identified a novel mechanism involved in regulating the lifespan of these antibody producing cells. This involves the shedding of a particular cell-surface receptor, named BCMA, which is known to bind factors that promote plasma-cell survival. The released segment that is cut off the receptor can be detected in the circulation, and the LMU group has shown that it provides a useful biomarker for monitoring the severity of autoimmune conditions. The new findings appear in the online journal “Nature Communications”.